Department of Public Works -- Monday through Friday, 7:00 a.m. to 3:30 p.m..
2004 update -- The Recycling Center is open from 7:00 a.m. to 11:00 a.m. Monday through Saturday. Items accepted include bottles & cans, newspapger, cardboard, magazines, car tires, car batteries, heavy metals, white goods, greas and branches under 3 inches in diameter (must be bundeled and tied). Effective June 1, 2004 the following items will no longer be accepted --leaves, tree parts over 3 inches in diameter, stumps, household food garbage, trash items, concrete, rocks and dirt. 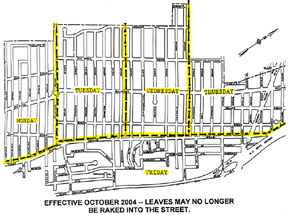 Effective October 2004, leaves may no longer be raked into the street for the DPW to "scoop-up" as in previous years. Recyclable materials are pickup on alternating Wednesdays. For example: Bottle, cans, and plastics then newspapers, cardboard, and magazines back to bottles, cans & plastics. Please consult you recycling calendar. White goods such as stoves, refrigerators and dishwashers, etc. must be placed at the curb for pickup. Please notify the DPW one (1) day prior to collection day. All recycling materials are accepted at the DPW Recycling Center, hours are Monday thru Friday, 8:00 am to 12:00 noon and 1:00 pm to 3:00 pm. Saturday, 8:00 am to 12:00 noon. No material is accepted at D.P.W. Recycling Depot areas. This is considered dumping and penalties are enforced. It is important to follow the instructions in the Solid Waste/Recycling Calendar . Leaves and grass will not be accepted in plastic bags. Refer to the calender for leave season guidelines. Residents may pick up a calendar at the Library or the Tax office located in the Municipal Building. No propane gas cylinder should be scrapped, destroyed, cut with a torch, punctured or have the service valve removed by the general public. The purpose of this informational fact sheet is to set forth-general safety practices for the use and disposal of propane gas cylinders. It is important that residents recognize and address any hazards associated with the use, recycling and disposal of these cylinders. Disposal in the municipal solid waste stream is prohibited. Hasbrouck Heights no longer accepts propane cylinders for disposal and/or recycling. There are some alternative disposal options. However, prior to the disposal of your propane cylinder, the following information may be helpful during use. Propane, like all fuels, is stored energy! Properly handled, energy is useful, convenient and safe. However, if accidentally released, energy can be destructive. PROPANE GAS CYLINDERS ARE NOT TOYS! Handle your stored energy with respect. Propane gas is actually odorless. A "rotten egg" odor is put into the gas so that its easy to detect if a leak occurs. Be sure everyone in your family is familiar with the distinctive odor. If you smell the "ROTTEN EGG odor near or around your propane gas cylinder immediately contact your local Police and/or Fire Department. When not in use, keep the valve tightly closed and plugged with the "POL" left handed thread plug. This will seal the propane gas cylinder and help prevent leaks if the service valve is accidentally opened. Never store propane gas cylinders inside an enclosed structure (leaks would be dangerous indoors or in unventilated areas). Store and use outdoors only. One alternative to disposing of propane cylinders is to have your local propane gas supplier inspect your cylinder for dents, gouges, defects, bulges, leakage, corrosion or excessive rust. Once the inspection is completed and the cylinder is approved, it will be requalified, and stamped with the requalification date. Subsequently, the cylinder may now he safely stored, sold, or donated. If signs or defect are observed, your cylinder will not be requalified and you will be required to remove the cylinder from service. Consult your local propane gas supplier for instructions on the safe disposal and/or recycling of the cylinder. The easiest way for you to dispose of leftover paint is too use it all up. Apply a second coat or touch-up area, which needs improvement. Leftover paint can be given to someone who has a need for the product. Contact neighbors, friends, relatives, church, theater groups, high schools, recreation departments, or community service organizations. Many of these groups will gratefully accept "LEFTOVER" paint. Latex paints must be left to dry by removing the lid or can be poured into an absorbent material such as kitty litter, shredded newspaper or sawdust. This should be done in an area, which is away from children and animals. Allow the remaining material to dry completely and dispose of the dried materials in your regular trash. After the latex paint is emptied from the can, the can then is placed with other recycled cans to be collected as scheduled. Oil-based (also known as solvent-based or alkyd) paint requires special disposal. Solvent-based paints are ignitable and present a particular hazard and should be disposed as a household hazardous waste. These products should never be emptied into storm sewers, household drains or on the ground. Residents should save their solvent-based paint for the Bergen County Utilities Authority Household Hazardous Waste Collection Days. For more information on Recycling, please call the Recycling Hotline 201-288-4112  For more information on Household Hazardous Waste Disposal please call the Hotline 201-807-5825. Hasbrouck Heights prides itself in the rapid, efficient clearing of Borough streets when a snow or ice condition occurs. By clearing and maintaining a safe road system, residents are assured of access to all parts of the Borough and the continuance of essential services. Do not shovel, power blow or plow snow from your driveway or walks into the street. Snow is to be contained within your property. Place snow either on your lawn or along the top of the curb section. Again not in the street. Shovel and/or make safe the access route to your household garbage receptacles. We cannot safely pick up your garbage if we cant safely get to it. In the event you cannot clear a safe path to the receptacles, we ask that you consider placing the receptacles at a safe location in front of your house temporarily. This way collection is assured. Please be patient  on the bad days we must take every precaution to avoid injury to our personnel. PLEASE, during snow clearing operation, do not park your car in the street. Parked cars create havoc in our attempts to clear the road surface. When cars are left in the street we must later return to the routes and plow the snow back to the curb. Be especially watchful of your children playing in the snow. Our vehicles are large, and although we plow at a slow rate of speed, our attention is directed to the task at hand. To our residents dismay, but to ensure the best flow of traffic, snow is plowed to the street curb. We realize this may cause some inconvenience and re-shoveling and we regret this necessary inconvenience. Spring Clean-Up will be on March 19, 26, April 2. Place leaves in paper sacks or upright container at the curb. Grass and hedge clippings will also be accepted at this time. Branches will not be picked up. PLASTIC BAGS ARE NOT ACCEPTED. Five brown bags are supplied only during spring cleanup. Garbage is any non-recyclable waste material generated from the kitchen. Garbage shall be in plastic bags placed in metal or rigid plastic containers with handles and covers. No loose garbage in cans will be picked up. Disposable diapers shall be placed in double plastic bags. Garbage will be picked up from the rear of the home. Containers shall not exceed 32 gallons in capacity. Drums and inground pit cans are not acceptable. Containers shall be kept at the rear of the premises with a maximum of two containers per household. IMPORTANT: All containers must be safely accessible. Dogs loose on the premises and locked gates will prevent collection. If garbage is placed at the curb for pickup, it must be in rigid containers, with covers. Trash is household material such as furniture, rugs, television sets, radios, stereos, toys books with covers and clothes/shoe boxes, barbecue grills, mattresses, microwaves, irons, vacuum cleaners, all wood products etc., but shall not include rocks, dirt and concrete. No more than 8 trash items shall be placed at the curb on collection day. Trash shall not be cast, dumped or thrown into the street or set out to the curb in a loose condition. Material must be in containers with handles or tied in bundles not to exceed 40 pounds. Cat litter and dog feces shall be placed in double plastic bags and disposed of as trash. Newspapers in bundles must be tied and placed at the curb. NO plastic or paper bags. Newspapers are collected with magazines, cardboard, telephone books, etc. Corrugated waffle type cardboard and brown paper bags must be flattened, tied and placed at the curb. NO pizza boxes. Cardboard is collected with newspapers, magazines, telephone books, etc. All magazines, catalogs, junk mail, telephone books, computer paper and hard covered books with covers removed must be tied in bundles and placed at the curb. Magazines, etc. are collected with cardboard and newspapers. Batteries including (flashlight, radio, toy, watch, etc.,) must be placed in plastic bag and placed on top of newspaper. All plastic and glass household bottles, tin, aluminum cans, empty oil base & latex paint cans may be placed at the curb in an upright container with handles no larger than 32 gallons. NO EMPTY ARESOL CANS, PLASTIC PLANT CONTAINERS, PLASTIC TOYS OR FOOD TRAYS WILL BE ACCEPTED with recyclable. DO NOT US PLASTIC BAGS. Stoves, washing machines, dryers, dishwashers, air conditioners, freezers and refrigerators may be placed at the curb. Freezers and refrigerator doors must be removed. Notify DPW one (1) day to prior to collection day for White Goods. Grass collections includes hedge clippings, garden plants, flowers, vines and small twigs. Grass pick-up begins April 9th and ends on October 15th. Place at curb in paper sacks or upright containers with handles not to exceed 32 gallons. After October 15th, the beginning of the leaf season, grass may be raked into the street along with leaves. Grass will not be collected in plastic bags. Grass is not collected with garbage but is picked up by a separate truck. Leaves are accepted at the recycling depot at any time in paper sacks or upright containers. Leaves may be raked into the street from October 14th through December 9th, and will be picked up on a non-scheduled but on-going basis. Leaves in plastic bags are not acceptable. Branches are not accepted with a leaf pick up. Branches and shrubs must be tied in bundles not to exceed 5 feet in length. Limbs more than 3 inches in diameter and stumps will not be collected. Branches may be put into containers but plastic or paper bags must not be used. No more than 8 bundles or containers shall be placed at the curb on collection day. Branches & Shrubs are not collected with garbage but picked up by a separate truck. Branches brought to the Recycling Center must be tied in bundles. Christmas trees will be picked up on Thursday for Zone 1 and Friday for Zone 2. Please remove tree stands, rope and plastic bags. Artificial Christmas trees are disposed of on trash days. 236-6. Removal of snow and ice required. The owner or owners, tenant or tenants of lands abutting or bordering upon sidewalks shall remove all snow and ice from the same within twelve (12) hours of daylight after the same shall be formed or fall thereon. Within the Boulevard business section, normally cleared by the Department of Public Works of accummulated snow, the sidewalks shall be cleared to within one (1) foot of the curb. 236-7. Removal of grass and weeds required. The owner or owners, tenant or tenants of lands abutting or bordering upon the sidewalks and gutters of public streets, avenues, highways and public places shall remove all grass, weeds and other impediments therefrom after notice to remove the same. All grass and weeds shall be cut to a height of less than four (4) inches from the ground. In case the owner or owners or tenants of lands abutting or bordering upon the sidewalks and gutters of public streets, avenues, highways and public places shall refuse or neglect to remove all snow or ice from the same within twelve (12) hours of daylight after the same shall be formed or fall thereon or all grass and weeds and other impediments therefrom after three (3) days notice, the Superintendent of Public Works may cause such work to be done under his direction, and he shall certify the cost thereof to the Council. Franklin Avenue East across Route 17 toward Teterboro Airport. At traffic light make a right turn onto Industrial Road. Follow Industrial Road to Railroad Street. Make a right at Railroad Street and then another right turn to 1 Plant Road. Recycling Center is the last building. No Left Turns  only rights. Hazardous materials, thinners, turpentine, solvents, and oil-based paints are NOT ACCEPTED AT ANYTIME. Cans with quantity of paint will not be COLLECTED or ACCEPTED by the DPW. NO liquid propane gas tanks will be COLLECTED OR ACCEPTED by the DPW. NO sheet rock, concrete, bricks, patio block, tile, dirt or topsoil will be COLLECTED OR ACCEPTED by the DPW. NO EXCEPTIONS. Call the Bergen County Utility Authority (B.C.U.A.) Hazardous Waste Hotline  (201) 807-5825 for information for hazardous material disposal. (See fact sheet). No resident shall place trash and/or recycled items at the curb before 7:00p.m. on the day prior to scheduled collection day, nor later than 6:00a.m. on the scheduled collection day. We recommend placing scheduled material at the curb at night prior to collection day. All contractors performing work or services must remove all debris and/or material resulting from their work. Contractors including landscapers, carpet installers, tree service, etc. The Recycling Center is open Monday through Saturday from 7:00a.m. to 12:00p.m. (noon). Closed Sunday. METAL PRODUCTS such as pipes, cabinets, sheds, fences, swing sets and above ground pool structures, CAR BATTERIES, USED MOTOR OIL, TIRES AND ANTI-FREEZE.